George Robert Ainslie (1776–1839) was a Scottish general of the British Army, noted for his coin collecting pursuits. Ainslie was the eldest son of Sir Philip Ainslie, Kt., and was born near Edinburgh in 1776. He entered the army as ensign in the 19th Regiment in 1793, and having political influence through his mother, a daughter of Lord Grey, was in the same year promoted lieutenant, and in the next captain in the 85th Regiment. With his regiment he saw service in Flanders, and in 1799, when he was promoted major, was engaged in the short and disgraceful expedition to the Helder. He seems to have shown no particular capacity as a soldier or much ardour for a military life, and so was in 1800 promoted to a lieutenant-colonelcy in a Fencible Regiment. 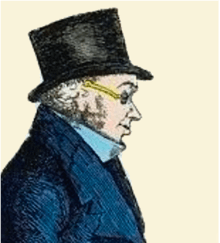 In 1802 he married a Miss Nevile, but did not again try for employment in his profession. He was, however, made lieutenant-colonel of the 25th Regiment in 1807, and promoted colonel by brevet in 1810. His influential relatives now obtained him a colonial governorship, that of the island of St. Eustatius in 1812, from which he was removed to Dominica in 1813. He does not appear to have distinguished himself more as a colonial governor than as a soldier, and fell into the hands of a clique at whose bidding he subdued the Maroons on the island with such thoroughness that it was called cruelty, and on an outcry being raised in parliament he was recalled from the West Indies in 1814. Ainslie's undistinguished military and colonial governorship forced him to accept a lower post in 1816, that being lieutenant-governor of Cape Breton Island. He arrived there in to find a colony in chaos because of lack of funds and uncollected taxes. Ainslie contributed to the situation by assuming a managerial stance similar to the one that had earned him this demotion. Basically the colony felt the taxes were illegal because of the lack of, and subsequent approval by, an assembly council. Ainslie's inability to deal with the crisis effectively destroyed the colony and it was re-absorbed into Nova Scotia on 16 October 1820. On that day Lieutenant-Governor Sir James Kempt of Nova Scotia officially proclaimed the end of Cape Breton as a separate colony. Major-General Ainslie, for he had been promoted previous to his recall, was now free from any active employment. Nature had designed him for a savant, not a soldier. His hobby was collecting coins. The taste for coin-collecting had much decreased in England since the days of Addison, and he found a clear field for his labours. He made a specialty of Anglo-Norman coins, and travelled all over England, and, what was then a more uncommon thing, all over the rural districts of Normandy and Brittany, in search of coins. He published in 1830 the result of his labours in a magnificent quarto entitled Anglo-French Coinage, adorned with many illustrations. By his industry he had got together almost a unique collection of rare coins, and, absorbed in the pursuit, died peacefully in 1839. Lake Ainslie on Cape Breton Island is named for him. George Robert Ainslie. Illustrations of the Anglo-French coinage: taken from the cabinet of a fellow of the antiquarian societies of London, and Scotland; of the royal societies of France, Normandy, and many others, British as well as foreign. 1830. ↑ University of Toronto (2000). "AINSLIE, GEORGE ROBERT". Dictionary of Canadian Biography Online. Retrieved 17 February 2011. This article incorporates text from a publication now in the public domain: "Ainslie, George Robert". Dictionary of National Biography. London: Smith, Elder & Co. 1885–1900.